A child’s smile affects everything from their diet to their self-confidence and personality. As your Mt Gravatt East family dentist, we understand how important it is to make dental care a positive experience for your son or daughter. That’s why we recommend checkups for every child starting at age one. By seeing your child from an early age, we’re able to familiarise them with the dental care environment and help them feel at ease when it’s time for a checkup. Plus, we can screen for potential oral health concerns, so that they can be addressed at an earlier and more affordable stage. A pain-free environment is always our top priority. We work at your child’s own comfort level, to keep things relaxed and free of unnecessary stress. We work closely with parents to address any concerns and educate them on the proper care of their child’s teeth. By addressing problems such as tooth decay — even in baby teeth — we can have a tremendous influence on the health of your child’s future adult smile. 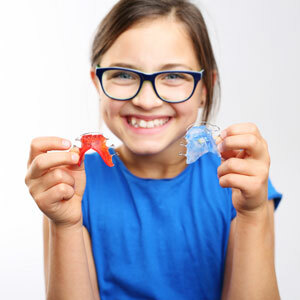 Preventative orthodontic techniques minimize the need for more extensive treatments later, as we can actively intercept them during your child’s early oral development. It’s never too late to bring your child to the dentist for the first time. Book your next visit online, today. Saturday appointments are available.